MEGabite #24 or #78 counting down. Tasty Tuesday with Ahi Tuna Spring Roll, soy lime dipping sauce, pickled ginger and wasabi at La Jolla restaurant in Montgomery, Alabama. Let me begin by giving thanks to Alabama Tourism for introducing me to my new favorite dish. 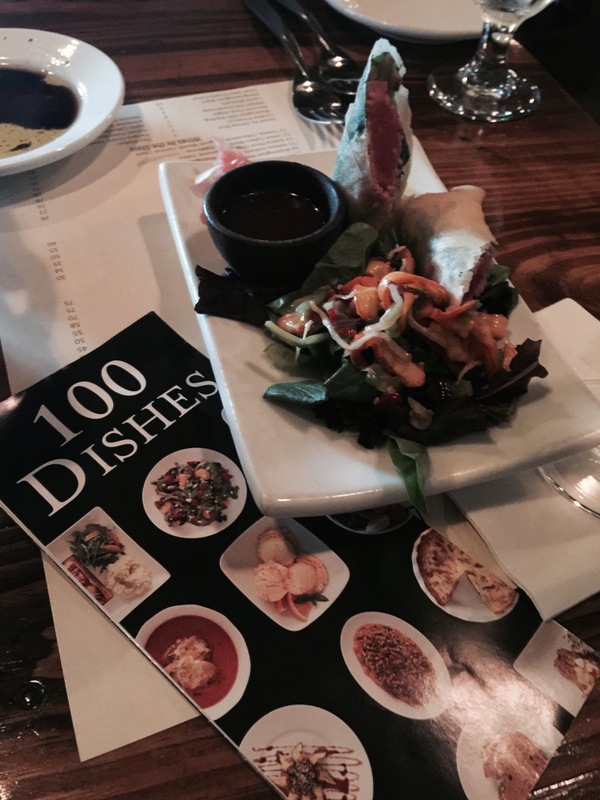 I have had the good fortune of tasting many dishes on my Alabama 100 journey. This dish epitomizes a perfect Alabama food experience (for me). It truly was love at first sight. The fresh yellow Ahi-tuna is sushi grade and the taste was apparent. Together with spinach and wasabi, wrapped and then flash fried to a crispy exterior. Important as the tuna was finished perfectly. The soy lime dipping sauce was really delicious and yet I was torn between “to dip or not to dip,” and simply savor that pure delicious tuna. It was that delicious. Served with a salad that was equally unique and extremely tasty. Really fresh greens with glorious calamari. I absolutely LOVED it! Although, I could have stopped at this dish, I really wanted to taste a few other items off of the menu. 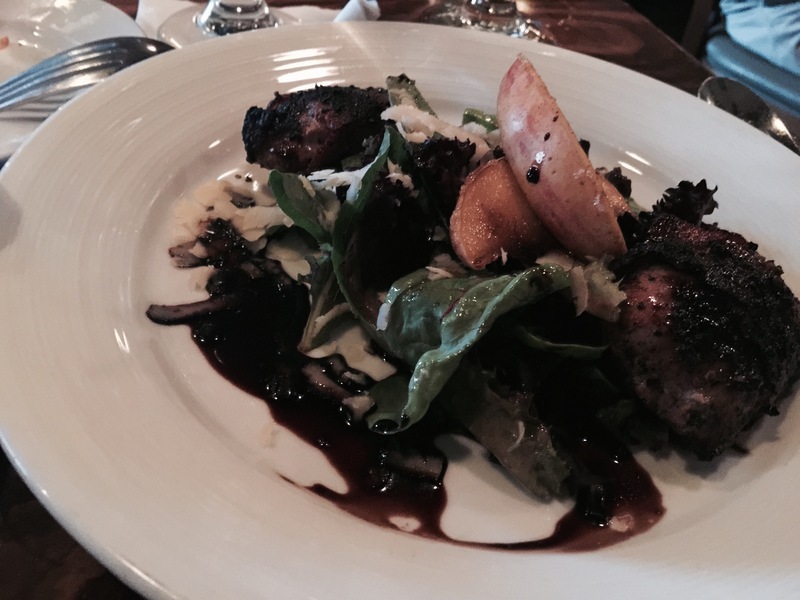 I ordered a salad made with; grilled bacon wrapped quail, maple balsamic glaze, mixed greens, roasted vidalia vinaigrette, Vermont white cheddar and bruléed apples. Yum! After recently purchasing a new spiralizer, I wanted to taste zucchini noodles done by someone who knows what they are doing. . When dining out, it is often difficult to make healthy and interesting choices. I appreciated that this dish was on the menu. 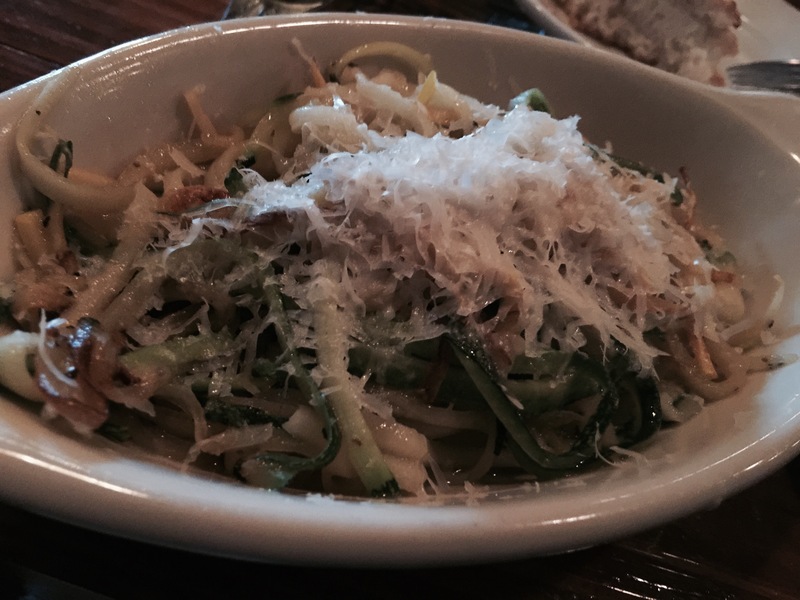 Zucchini noodles made with pecorino and Tuscan olive oil, this dish did not disappoint. I am further inspired to expand my zucchini noodle menu at home. Thanks chef! Some additional things that I loved about La Jolla. I have become increasingly aware of the food that I consume. I want clean food, real food, local food and slow food. Aside from playing 100 Dishes, I choose to eat real food that feeds my body in a healthy manner. In addition to that, I love foods that rock my world. La Jolla, you rocked my world! They cook on the Big Green Egg Grill. I realize that I am using the word “love” quite a bit in this write up. But, this is how I feel about this grill. 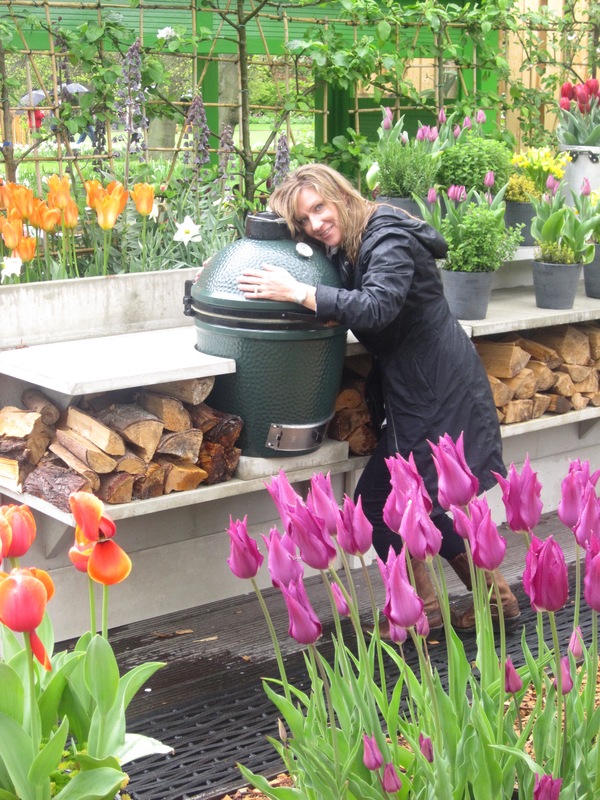 This snap was taken in The Netherlands and some day, I am going to re-create this cooking area. I found it wonderful and refreshing that the farms and other local businesses are highlighted on their website. Wonderful experience. Hats off to you Chefs and folks at La Jolla. MEGastars; 5 ***** I have been giving out a lot of 5 stars based upon my own criteria. (However, just you wait.) This stop will be what all other stops are measured against. I had a perfect experience. **** THE tastiest experience that I have had playing 100 dishes thus far. For a wonderful atmosphere with folks who were friendly and professional. The man who was our server was knowledgeable but even more impressive was his knowledge of detail and the spirit of passion came through. They sure met the goal of customer service as noted on their website mission statement. To note, this dish met the criteria set forth by Alabama Tourism for local food crafted with Alabama pride. * The fifth star because this dish made me quiver. It was literally to die for. I simply can not wait to return and have this Ahi again. MEGabite nirvana! 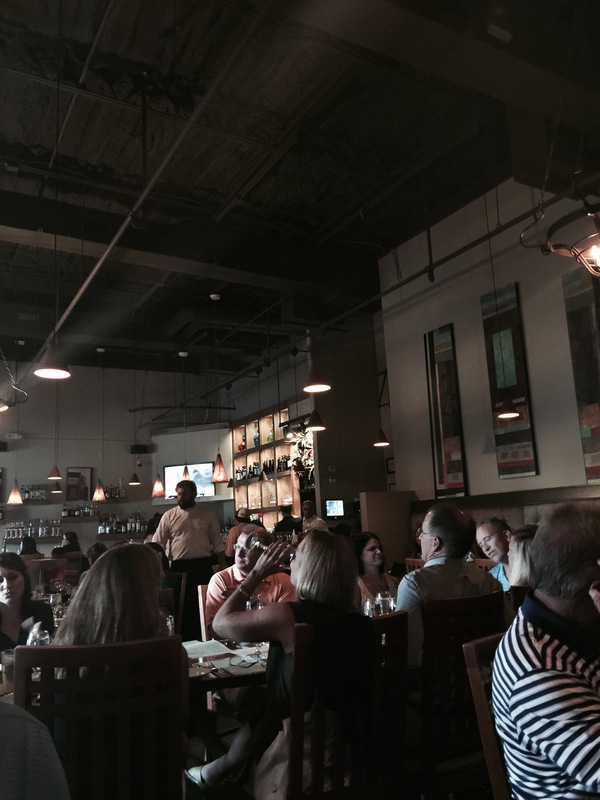 La Jolla is no longer in the Eastchase location. Located just a few moments drive in The Peppertree Shopping Center. This is a BIG one. This dish is ONLY served on Wednesday’s. La Jolla is not open for lunch. Do not be skewed by reviews that you might have read. This restaurant IS meeting their mission statement. Visit them. As far as the reviews on the price point. I had no issue with cost. 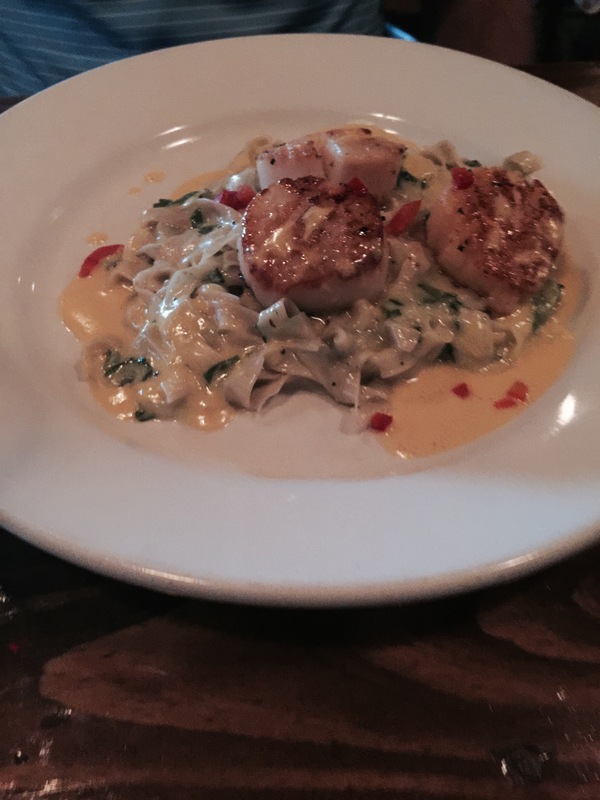 Example; the small plate of scallops was $23. I personally felt it was fair for food cooked to perfection. Homemade fettuccine noodles with scallops, seared on the Big Egg grill. This labor-intensive dish coupled with perfect service, was well worth the cost. I use a 5 MEGastar system. I am not a food critic, just Meg, a curious traveler, with an interest in trying different foods and sharing my two cents on food experiences. I try to follow my star system so that I may be fair to the wonderful dishes on this list.